A summit reached at the end of a long journey: Florian Boesch and Malcolm Martineau at the Wigmore Hall, as the two-year Complete Schubert Song series draws to a close. Unmistakably a high point in the whole traverse. A well-planned programme of much-loved songs performed exceptionally well, with less well known repertoire presented with intelligent flourish. 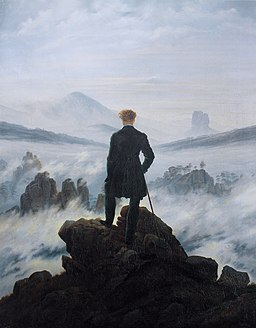 Boesch and Martineau began at the peak, with Schubert's Der Wanderer D493, (1816 Schmidt von Lübeck). "Ich komme vom Gebirge her". A deceptively simple phrase, but delivered by Boesch with great authority, for this song is the quintessential symbol of the whole Romantic revolution. The song is itself a journey. The resolute beginning gives way to desolation, then to the short, lyrical "Wo bist du, wo bist du, mein Geliebtes Land". As Richard Stokes has written, the song "takes the form of a short cantata". Boesch's flexibility allowed him to mark the transitions clearly without sacrificing the line. In the last verse, his voice moved from firmness to despair, descending to ghostly whisper, so the last words rang out with anguished finality, connecting the last verse with the first. One of the most rewarding performances of Der Wanderer I've ever heard, and I've heard hundreds. With its regular, repetitive lines, Der Pilgerweise D 789 (1823). can sometimes sound undistinguished, but Boesch and Martineau brought out its depths. The pilgrim is a beggar who struggles on though "Thread after thread is torn from the fabric of his happiness". So why carry on? No mention of religious faith in this text, written by Schubert's raffish friend Franz von Schober. Perhaps this pilgrim is the epitome of an artist, driven to create. He's poor but has the gift of song. Boesch coloured the words with gentleness, suggesting quiet strength. Rewarded be, those who hear the song so well interpreted. In Der Wanderer an den Mond D870 (1826, Seidl), Martineau depicted the steady tramping pace in the piano part, over which the vocal lines float with carefree lyricism. In some ways, this song is the opposite of Der Wanderer. In the context of this programme, we were looking backwards before moving forward. I had wondered why Boesch's body language had become quite jaunty towards the end of Der Wanderer an den Mond. This fitted the upbeat mood, but also proved a good introduction to An den Mond D468 (1816,Hölty) Provocatively, Boesch spoke a few words before starting. "What's this song about? Who,is dead, the girl, or the man?" It's a curious poem, with an unidentified protagonist gazing down from the sky. Who is weeping on who's grave? A stimulating approach. There's no reason Lieder should be grim and stiff. Perhaps this was a song Schubert played in the company of friends, enjoying themselves for sheer pleasure. Two more happy songs: Der Zufriedene D320 (!815, Reissig) and Der Weiberfreund D271 (1815, Abraham Cowley, translated Ratschky). The first concise and pointed, the second risqué. From contemporary drawings, we can assume that Liederabend audiences were open minded. Endless variety: the pious An Die Natur D372 (1815-6, Stolberg-Stolberg), with Bundeslied D258 (1815, Goethe). Schubert treats this as a drinking song, while Beethoven, setting the same text, makes connections to the drinking clubs of the time which fuelled political action. Thus Boesch and Martineau ended the set with Lacheln und Weinen DD777 (1823, Rückert). Laughter and tears - the landscape of Lieder is vast and varied. Der Sieg D805, (1824 Mayrhofer) is an anthem, but its brave front is disguised by references to classical antiquity. The protagonist has slain the Sphinx. The song resumes in repose ("O unbewölktes Leben !") but the way Boesch sang the critical line "Und meine Hand - sie traf" haunted the peace with a sense of horror. Two songs of Spring, Frühlingsglaube D686 (1820 Uhland) and Im Frühling with An den Schlaf D447 (1816, anon) and Abendstern D 806 (1824 Mayrhofer), beautifully articulated by Boesch and Martineau. This set of songs was balanced by the final set, with Prometheus D674 (1819 Goethe) and Grenzen der Menschheit D716 (1821 Goethe) , powerful songs which Boesch can sing with authority, all the more moving because his approach can evoke more sensitive feelings. Limitations of mankind, for men are human, not gods. Thus the unforced elegance of Boesch's An den Mind D296 (1819, Goethe and the tenderness in the two "motherhood" songs, Grablied für die Mutter D616 (1818 anon) and Die Mutter Erde D788 (1823 Stolberg-Stolberg). It's surprising that this song isn't performed more often as it exemplifies many of the themes in this Wanderer journey. The piano introduction is finely poised, suggesting slow footsteps "schwer und schwül". In the moonlight, someone is being buried. Diminuendos and a minor key, but the mood is "erhellt von sanfter Hoffnungn Schein" Mother Earth holds us all. Death does not triumph. This concert was being recorded live. If it's released, this song will be one of the highlights. Boesch and Martineau's encores were An den Mond D296 (Goethe) and Nachtviolen D752 (!824 Mayrhofer).